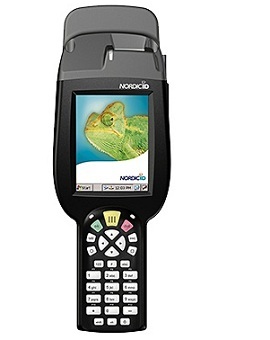 Mobile rugged handheld for data collection of RFID HF tags with optional Auto-ID functions. The Nordic ID Merlin HF RFID mobile computer is designed to ensure performance. It can read and write tags enabling data transfer from a barcode to an RFID tag conveniently on site allowing the same system to simultaneously use both identification methods. New standards and software updates can be distributed remotely, which ensures support for the future and secures the investment by extending the product’s life-cycle. Nordic ID Merlin HF RFID uses near-field inductive coupling and thus has an excellent immunity to environmental noise and electromagnetic interference (EMI). HF RFID has advantages over other frequencies (such as UHF RFID) by being able to read and write a tag in the presence of liquids and other obstructions. One of the benefits of HF RFID technology is that the same band is available worldwide. The Nordic ID Merlin series covers all established communication standards like Ethernet, WLAN, Bluetooth and GPRS, and data collection; HF RFID and/or 1D/2D barcode. Setting up the Nordic ID Merlin is simple and cost-effective. The intuitively operated Windows interface requires but little training, immediately enabling you to fully work with the new system and to achieve benefit from it. The mobile computer runs with Microsoft® Windows® CE 6.0, i.e. the familiar operating system. The illuminated colour display (portrait) can be controlled with a touch pen or your finger and ensures good readability under all light conditions. The high-performance 532 MHz processor has up to 256 MB DDR RAM and 288 MB Flash memory. Moreover, an additional Flash memory of nearly any size can be integrated into the mobile computer using the microSD card slot.